Australia’s best shed and steel building quotation software! Trusted by hundreds of business Australia wide. ShedTech - Setting the Standard! We offer a complete solution for independent shed sellers or companies with an existing distributor network.Our software will allow you to design and quote portal sheds to 25 metres wide, skillion sheds to 12 metres wide, barns, gable and skillion carports, garaports, attached awnings, patios and stud frame buildings to meet your client’s requirements in seconds. 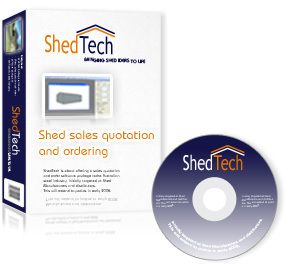 The options are endless.Our shed design software is more than just a quoting and ordering tool. It is a complete business solution that also includes sales reporting, client payment details, email integration and an automated ordering process.. Accredited!ShedTech and Shed Alliance is pleased to announce that we have been granted Shed Safe Accreditation by the Australian Steel Institute and Steel Shed Group. SHEDSAFE is an accreditation scheme managed by the Australian Steel Institute, designed to assist shed buyers in making an informed purchase decision. Our system has been proven to surpass ASI guidelines and criteria. Primarily, ShedSafe® is about safety for the consumer and it serves to protect the investment in a shed and its contents. Consumers can be confident in the fact that ShedTech and Shed Alliance ensure that all standards set by the BCA are incorporated into the design process of each shed. Our mission is to offer Australia’s best IT solution package to shed resellers with real time 3D steel building design for quoting, sales management, engineering certification and ordering.